If you visit the Washington Poet Laureate website, you’ll find a profile of the current PL, Claudia Castro Luna, and a list of the state’s previous poets laureate: Samuel Green (2007 – 2009), Kathleen Flenniken (2012 – 2014), Elizabeth Austen (2014 – 2016), and Tod Marshall (2016-2018). Western Washington University professor Laura Laffrado is, pretty much single-handedly, working to correct a very significant omission from that list: Washington’s first poet laureate, Ella Rhoads Higginson. An article by Ron Judd in the Sunday, June 24, 2018, PacificNW magazine section of The Seattle Times details Laffrado’s monumental task and the passion she shares with her WWU students. If you missed it in print, you can still read it online. It’s not very often that you Google the name of a film and come up with exactly two links (at the time of this writing). So, while we continue on our quest for all things poetry-plus-film, we can’t really tell you very much about “Wild Nights With Emily Dickinson” except that it is a feature film starring Molly Shannon and Dana Melanie. This should be good: Quake: An Everett Lit Walk. Five venues in Everett’s Hewitt Avenue Historic District (starting and ending at Black Lab Gallery), fifteen writers, and loads of fine words. Hosted by C. C. Hannett, David Callaway, and Emma Bianchi, you’ll hear the voices of Fitz Fitzpatrick, David B. Clark, Jennifer Faylor, Sarah Galvin, Matthew Spencer, Robert Lashley, Carolyn Agree, Annette Kluth, Ru Otto, Laurie Langston, Never Angel, Elizabeth Vignali, Anastacia Tolbert, and David Johnson. The shaking starts at 1:00pm on Sunday, July 8, 2018. Hang on. 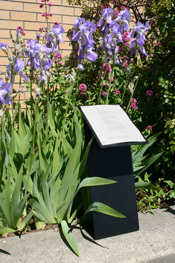 Sooner than expected (it’s usually late July), the ten Walk Award poetry plaques for the 2018 Sue C. Boynton Poetry Contest have been installed in front of the Central branch of the Bellingham Public Library. They will be on display for a year. Take a poetry walk and enjoy some winning poetry from Whatcom County, Washington. It’s no longer the weekend. Get back to work. Hold on. Before you go, you have a few minutes, right? And you’ve been wondering what you should do with that photo you took… the one where you were staring at the cottage-cheese ceiling and saw Walt Whitman’s face? Apparently, if it happened within a hundred miles of Seattle, it belongs on Liminal Seattle.